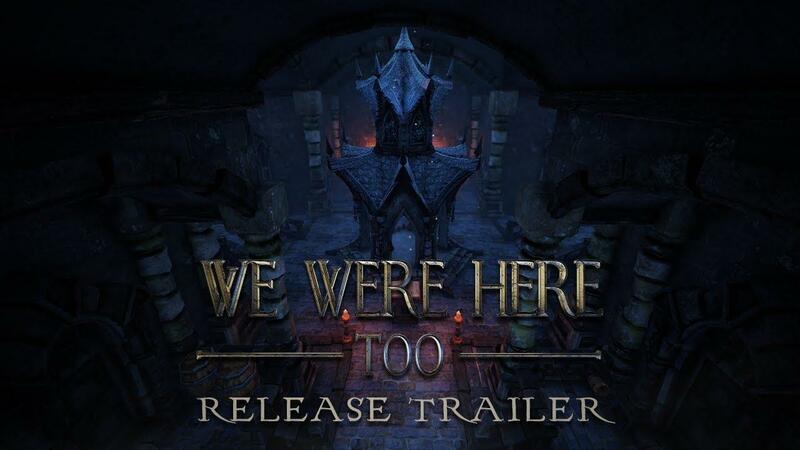 We Were Here Too [Steam, Official Site] is a very interesting puzzle game, one where you and a friend team up and walk through different rooms and solve puzzles together using your walkie-talkies. Myself and Samsai recently did a livestream of some of it and it was quite a memorable time. We have since completed it together, so here's what I think. It's quite a unique experience, as large parts of the game have you both alone in your own areas of this castle. Unlike anything I've played before that's for sure, very strange with you each needing to describe various parts of your room, to be able to come up with solutions to the puzzles therein. The puzzles are a pretty good mix overall, some slow and some that keep you on the edge of your seat with death approaching. Disclosure: Keys provided by the developer. It will test your patience, it certainly tested ours that's for sure. Having to describe things you've never seen before, to someone who can't see what you see, with you together needing to come up with solutions. It's frustrating, but it's also quite engrossing because you're so absolutely focused on searching around for every possible clue you can find. There was one particular moment involving a stairwell that was vanishing before me, with me relying on Samsai being able to solve a puzzle based on what little information I could provide to him. The panic starts to become real, you don't want to fall into a pit of lava, you start quickly describing everything you see. The problem is, the walkie-talkie system of course only allows one of you to talk and listen at a time, so when you're panicking, you're likely talking over each other and it becomes even more difficult. There's also been some moments of complete communication breakdown, like when I had to run through a maze needing prompt directions, but at times Samsai couldn't keep up or I went the wrong way and the frustration probably became quite apparent to people watching us. It was amusing at the same time though, with us both trying to come up with solutions to help with it. It took a long time to get through that one "Go left, then right—NO I SAID LEFT" and repeat. Pretty sure we both wanted to slap each other by that point. In the end, I wanted to try something which resulted in a gate opening for Samsai, naturally he took it to freedom leaving me to rot alone—that's friendship for you! The ending there was a bit abrupt too, especially if you weren't the one escaping as it just ends up going right to a cutscene. Without spoiling how, I will say one thing: if you want the "good ending" you have to play through the entire game all at once, which did annoy me once I found out. One issue that did really frustrate me, was that during one puzzle room the in-game walkie-talkie just seemed to break. Samsai could hear me, but I couldn't hear him. The light on my unit would flash, to show that he was trying to communicate, but it just stopped working. I've seen a fair amount of reports of it randomly breaking too, so hopefully they find and fix all those issues. Apart from that one issue, the rest of the game did work really well. There's been complaints about the length of the game, but that varies wildly based on your communication, your skills of observation and your ability to think under pressure. There's 8 rooms in total, some of which have multiple parts to them, so there isn't a huge amount of content, but as always it's how much you enjoy the experience that matters. Issues aside, I did really enjoy it. I wouldn't play it again (it was worth playing though, for sure), but I would love to see more games like it. You can find We Were Here Too on Steam. Also, we don't talk about the moment I got scared and fell into lava. There's a free predecessor as well. Did anybody try playing one of these with a Windows system on the other side? Eike There's a free predecessor as well. Sadly we were here, the predecessor, doesn't work at all as advertised on linux. It's essentially unplayable. Quote There was one particular moment involving a stairwell that was vanishing before me, with me relying on Samsai being able to solve a puzzle based on what little information I could provide to him. Quote It took a long time to get through that one "Go left, then right—NO I SAID LEFT" and repeat. oh yeah..and that reminds me..sorry for flooding twitch chat with "up down right etc"
Quote In the end, I wanted to try something which resulted in a gate opening for Samsai, naturally he took it to freedom leaving me to rot alone—that's friendship for you! The problem with this game is that it's a one-off. Yes it can be really funny and entertaining to complete (might lose a friend in the process but hey..). And that's it. The only thing you can do after finishing it is to switch sides with your friend. Actually, @SadL. The puzzles are randomized to some degree, so it's worth playing through it at least once on each side and then one more time for the full good ending For the price, that's some solid fun! nox Actually, @SadL. The puzzles are randomized to some degree, so it's worth playing through it at least once on each side and then one more time for the full good ending For the price, that's some solid fun! Yes there is some randomization going on, but the "way to solve" the puzzles remain the same(hopefully I am not mistaken here) so there isn't really replayability in my eyes at least(apart from switching sides). I have no idea what you mean by saying "full good ending" ..but I guess its a spoiler thing. I will agree with your last sentence though. It can be a really funny experience and if you find a willing friend it's worth it. Yes I tried to but it is kind of broken on Linux so I simply deleted it again. The problem was that when you start the game there will be an intro that seems to hang and you can't press the skip button because the game loses the mouse input so all you can do is press alt+F4. Shame because it looks fun. Does the paid version run properly on Linux? Eike Did anybody try playing one of these with a Windows system on the other side? In "we were here" it's crossplatform. Should be the same here. You say "betrayal". I say "survival". I think this would be really fun. Added to my wish list. For $10, a good co-op game doesn't have to be long.